Natural Remedies for Seizures: Is Epilepsy Inflammatory? Natural Remedies for Seizures: Is Epilepsy an Inflammatory Condition? The superficial understanding of epilepsy is that you have a region of brain cells that fire excessively, causing problems. If we can lock down the action of these cells, everything’s all good. This is an incredibly simplistic view of seizures, but this is usually as far as most neurologists will get. The entire effort of an epileptic patient is focused on controlling the seizures. If this is successful (and, on the first shot, this happens only about 30% of the time) then everyone high-fives each other and pats each other on the back. All of the anti-epileptic medications attempt to prevent a cell from firing in one way or another. But, as I’ve certainly mentioned before, this does nothing to address what created the problem in the first place. Why was this brain cell or region of brain cells “sick” to begin with? To me, this should be the most critical question asked, yet rarely is. 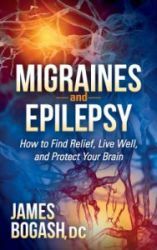 My book, Migraines and Epilepsy, delves into the “why” question quite heavily. Of critical importance is how effectively our brain cells can generate energy in the form of ATP (a process that occurs in the mitochondria—the powerhouse of the cell). Anything that begins to disrupt the ability of the brain cell to generate the massive amount of energy that it requires to function normally is going to create a problem. Inflammation can do just that. It is a drag on the system, shifting needed resources to prepare to fight off some invader or other stressor. In this particular study, the researchers looked for links between epilepsy and inflammation. While all this sounds a little technical, the bottom line is that they were looking for whether or not inflammation was related to seizure severity and whether or not iron status was also related to seizure activity. They looked at the interictal period (ictal = the time during a seizure, so “inter” ictal would be the period of time when a seizure was not occurring). Seizures themselves create a great deal of inflammation to the brain during the ictal period, but by checking the interictal period, it is a much better reflection on what is going on in the epileptic’s physiology. There was an increase of IL-6 and a decrease of TNF-α in the epileptic patients. There were also changes in iron metabolism consistent with acute inflammation. Those patients who had longer durations of epilepsy had lower levels of TNF-α. Overall, while the results of this study are pretty detailed, the bottom line is that inflammation has a clear role to play in epilepsy. Whether it is directly related or whether it is indirectly related by lowering the ability of red blood cells to deliver enough oxygen to the brain has yet to be seen. What we can determine, however, is that anti-inflammatory lifestyles high in omega-3 and lower in omega-6, lower stress, unprocessed foods and contains exercise is going to have a strong benefit. There have been studies on all these aspects, demonstrating that the better you take care of yourself, the less likely you are to have seizures.